​The first thing I tell students who choose historical fiction for their genre is: Follow your characters, trust them, become them, and see their world through their eyes! ​While the details of a specific time period are important, it's the writer's ability to immerse his or her readers in the characters' lives that is the most important element of writing historical fiction. While research is fascinating and invaluable when writing historical fiction, it can become addictive to the point of controlling your story. History is just the backdrop. Characters drive the story! Remembering this is a sure-fire way to keep the balance between research and actually writing your scene! Too much historical fact bogs down your story. The right amount, interwoven into the lives of your characters, brings the story to life. Historical Fiction and The Five Ingredients Of The Scene: ​I’ve put together the series of picture prompts below to introduce you to the power of The Five Ingredients. Whenever a new student begins this exercise, we always start with Point of View, which we'll do here! Point Of View: Which of the characters draws you into this scene? The obvious one is the woman. 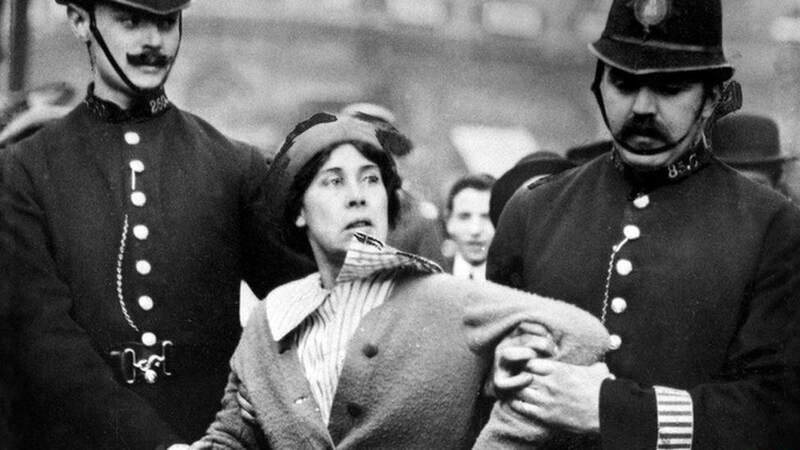 She's a suffragette... But she also could be a thief who has just been apprehended outside a department store. Or is she a schizophrenic who has accosted some innocent bystander? Questions such as these open the doorway to your imagination and guide you into your character's point of view. You can't know the truth about a character by looking at them from the outside. You may think you know who the woman above is, but you have to get inside her point of view to find out. The truth about a character is always surprising! Before you begin to write your scene, look at the policemen. Maybe one of their stories is calling to you. And then there are bystanders whose point of view might hold your interest. Point of view puts you inside your main character's head, heart, and gut -- you see the world through the eyes of your character. Point of View is one of the most liberating techniques in fiction writing. It gets you out of yourself and into your character. And then the imagination takes off!